Fact: Labor law updates occur several times throughout the year. Our State & Federal Labor Law Poster + Replacement Service ensures you display the most accurate, up-to-date poster at your workplace. Simply sign up for a one-year plan and your poster compliance is guaranteed. 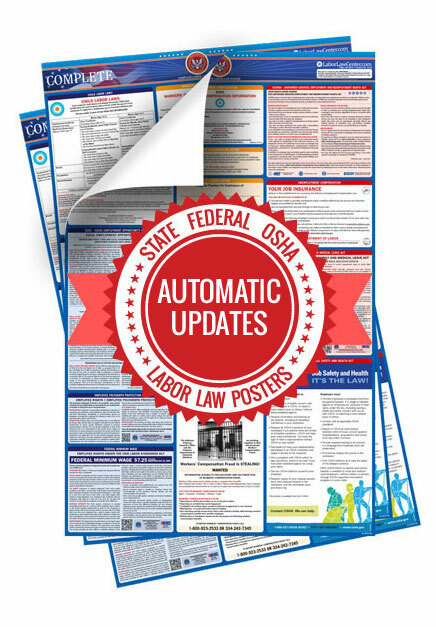 Your service includes the most up-to-date labor law poster PLUS replacement posters shipped to you any time your poster goes out-of-date.This means anytime there is a mandatory update we'll ship you brand new posters at no additional cost. 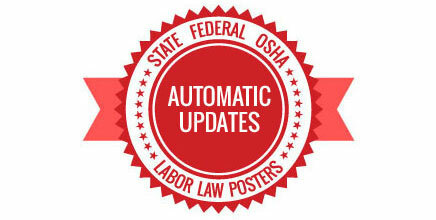 The most recent All In One Labor Law Poster for your state (State, Federal, OSHA, and local laws postings) is shipped to you. Displaying this in your workplace will satisfy posting requirements for small or large general businesses. Our compliance experts keep you informed of any updates to State, Federal and City labor laws. When a mandatory change occurs , you'll be sure to know before the posting deadline. Unlimited poster shipments for mandatory changes at no additional cost. Peace of mind with exclusive information on the latest labor law changes . Guaranteed Poster Protection* - if you receive a fine during your year of membership ,we pay the fine. For small bussiness, the costly risk of non-compliant posters(up to $17,000) is a high price to pay. Staying up-to-date on all labor law changes, however, is a high price as well in terms of required time. For a low-priced yearly subscription, our Replacement Service auto-ships you updated posters every time you need to update your postings. This ensures your workplace compliance. Managing workplace poster compliance for multiple locations in multiple states is easy with the Replacement Service. Just choose the states and number of locations you want protected and each time a mandatory update occurs, you can rest assured that a new poster is on its way! We make multi-state compliance easy! Schedule a Free Compliance Consultation Today & Talk to One of Our Compliance Experts .We'll walk you through our variety of poster solutions while offering useful guidance on how to stay 100% compliant, year-round. We can fully customize an order that makes most sense for you needs. Talk to us today! "Now when there are changes I get the notification sent directly to me. I don't have to go and hunt down the information elsewhere - or forget to get it posted . This is truly a lifesaver. Thank you!" "I like the service because it keeps our company compliant without any worry. I get what I need when it's needed"
While a new State & Federal law poster makes your workplace compliant now, if a mandatory law change occurs your posters will soon be out of compliance. This puts your workplace at risk of fines up to $17,000. The Replacement Service not only ships your workplace the most up-to-date posters well before the posting deadline, but guarantees your compliance. Should you receive a posting violation fee while using our service, we'll cover the penalty - no matter what the cost. But don't worry, in over 19 years we have yet to receive a posting violation. All compliance plans start you off with a new state and federal labor law poster to get you on the right track for compliance. This poster is included at no additional cost and shipped FREE. As labor laws become more complex, certain workplaces may require additional posts for city-specific laws. Our Replacement Serviceincludes any and all mandatory city-specific postings. Our compliance experts make sure your poster includes all required State and Federal laws employees need to see. Should you receive a posting violation when displaying our posters, we pay the fine – whether it's $100 or $100,000. With that said, our track record for ZERO posting violations says it all. Any time a mandatory poster update rolls around, we will ship the updated posters to you at no additional cost.